The stage is set. The seedings are set. The teams are set to battle in the Challengers Stage at IEM Katowice 2019. But, the player-driven seedings will bring about a change in the format. While you may have put your favourite teams as 3-0 or gone for some generic 0-3 picks, we provide you with a little insight into how the seeding might affect your decision. The first matchups are already known. We assume the favourites all manage to win, except in the AVANGAR vs Renegades match, which is likely too close to call and a potential upset from Vega Squadron in the G2 game. The seedings will then play a massive role. Among the 1-0 teams, Fnatic should get Vega Squadron. NRG will get the winner between Avangar and Renegades, Cloud 9 will get Vitality and Nip will square off against ENCE. 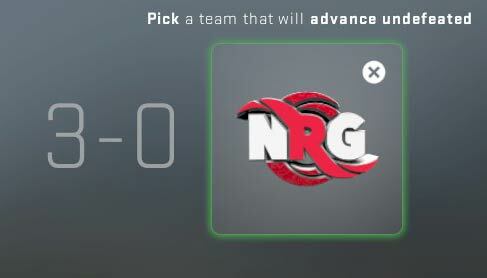 Let us now assume Fnatic and NRG win their respective matches. Then, we are left with Cloud9/Vitality and NiP/ENCE. If Cloud 9 wins, Fnatic will get either NiP or ENCE. But, if Vitality win, Fnatic will face the French heavyweights. We assume Vitality have what it takes to beat Cloud9 and ENCE somehow overcome NiP. We are left with Fnatic vs Vitality and NRG vs ENCE as the two 2-0 matchups. While Fnatic is not a sure bet against Vitality, NRG is a heavier favourite in comparison, if matched against ENCE. We are going with the above simulated result, which puts NRG in a great position. Now, suppose, if G2 were to beat Vega Squadron in the first matchup, we could see Fnatic face the winner of Avangar and Renegades while NRG gets G2. Either way, we feel NRG are good to go at least 2-0. And you can check various simulated results to see that, should NRG and Fnatic both go 2-0, NRG will have a more favourable matchup than the Swedes. No fooling anyone, Vici Gaming is the easiest option for 0-3 and we can back that up with an explanation in line with what we said above. 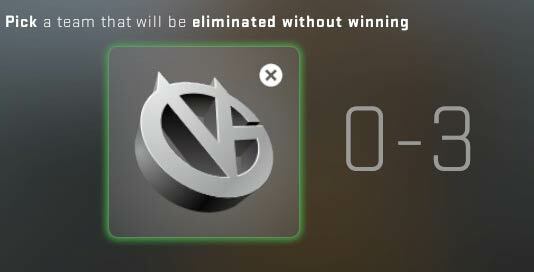 In the first set of simulation, we are going for G2 to lose to Vega. Should that happen, Vici will get matched with G2, which, like their opening fixture against Fnatic, will be another match where they are expected to lose. If we assume Vega loses, Vici will still go up against the loser of the Avangar and Renegades matchup. We feel Vici will reach 0-2 either way. In the elimination matchup, if we go by the first simulation, Vici should come up against either Avangar or Renegades. If the second one comes true, Vici should face Spirit while Grayhound goes up against Winstrike in the other 0-2 one. While Vici Gaming has done well to qualify for the event, we feel they will be a bit underprepared or overwhelmed by the situation. Can go for Grayhound as well. TalkEsport Picks Fnatic, Cloud9, NiP, ENCE, Vitality, Vega Squadron and FURIA to qualify. FURIA are largely an unknown quantity and a team we believe to have immense potential to surprise the CSGO fans at the major. They have quirky and early round boosts with an aim to gain advantage from the get-go. But, what surprised me was their ability to be calm in clutches and close encounters, which suggests there is more substance to the FURIA lineup than just pure ability. While FURIA might find it difficult to match up to the big teams, we expect them to dominate the teams in and around their seeding. We expect them to come very close, if not qualify. G2 on the other hand, just look underprepared and a lineup that seem like they are biding their time till the post-Major shuffle. All the other teams mentioned might already be common with others as they are largely the favourites. Another outsider is TYLOO, especially with so many ‘underdog’ lineups making it to the New Challengers Stage. What are your picks? Tell us in the comments below.